Pennsylvania gaming regulators are warning their online licensees to ensure their operations are compliant with the US Department of Justice's new interpretation of the Wire Act. On Friday, the Pennsylvania Gaming Control Board (PGCB) issued a memo to its online gambling licensees – none of whom have actually been cleared to launch their local sites – giving them 30 days in which to clarify how their individual operations might be affected by the DOJ's new view on the Wire Act. On Monday, the DOJ's Office of Legal Counsel made public a new legal opinion that the 1961 Wire Act applied not only to sports betting but to most forms of interstate online gambling. That opinion reversed a 2011 OLC opinion that led numerous states to launch online lottery, casino and poker products for customers within their respective borders. Confusion reigns over what the new opinion means in practical terms, although most observers believe the online poker liquidity-sharing pact between operators in Delaware, Nevada and New Jersey is living on borrowed time. Interstate betting on horseracing, which got a federal carveout in 1978, seems to be the only form of gambling that's in the clear. Nonetheless, the confusion is such that the National Thoroughbred Racing Association felt the need to publicly urge banks and credit card processors not to stop processing transactions for advance deposit wagering operators. The PGCB's memo claims that the new OLC opinion "does not … negate the premise that 'intrastate' activity as provided for by state law is permitted." 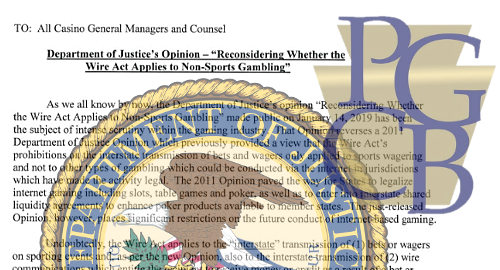 As such, it is "paramount" to ensure that all information regarding bets and wagers – including payments traveling twixt sites and customers — "does not cross state lines." That's a problem under the PGCB's current online regulations, which permit online licensees to base some of their digital infrastructure outside the state. The PGCB no longer believes that this allowance "is consistent with law as articulated in the [OLC] opinion." The PGCB acknowledges that this could cause no shortage of headaches for its online licensees, but insists "it is a change not of the Board's making but one commanded by the changing interpretation by federal law enforcement authorities." The DOJ announced a 90-day pause in enforcing its new opinion, but the PGCB wants to get out ahead of this issue before that April 15 deadline draws near. As such, it's given its licensees until February 18 to submit their analysis of their individual situations along with details of any necessary course corrections. The DOJ's Wire Act rethink has been widely interpreted as a favor to Sheldon Adelson, the boss of casino operator Las Vegas Sands, a major Republican campaign donor and a staunch opponent of online gambling. Sure enough, the Wall Street Journal reported Friday that the DOJ's legal reasoning supporting its new opinion mirrored arguments the department received from Adelson-funded lobbyists in April 2017. Adelson's hired guns – a law firm headed by former DOJ official Charles Cooper – crafted a memo, which was passed on to the DOJ by another Adelson-connected attorney, and the DOJ's Criminal Division subsequently asked the OLC to have another look at the 2011 opinion. While some legal eagles maintain that the latest opinion isn't likely to withstand a legal challenge, and prosecuting offenders under the new opinion won't be easy, Adelson and his DOJ sock puppets have succeeded in gumming up the works for states like Pennsylvania who were in the process of launching online operations, as well as for states that were considering joining the intrastate online club. Ain’t democracy grand? The post Pennsylvania warns online gambling licensees to comply with new Wire Act opinion appeared first on CalvinAyre.com.